Motor Loon’s Oceanic Mk 1 was the buzz of the SL Cruising Crowd this past month. Although it was Loon’s first official sailboat release, Oceanic received uniform praise from cruising captains who were impressed with the accuracy of the build and the humor and innovation incorporated in the vessel’s design. Anyway, Motor Loon is back with a new cruiser! 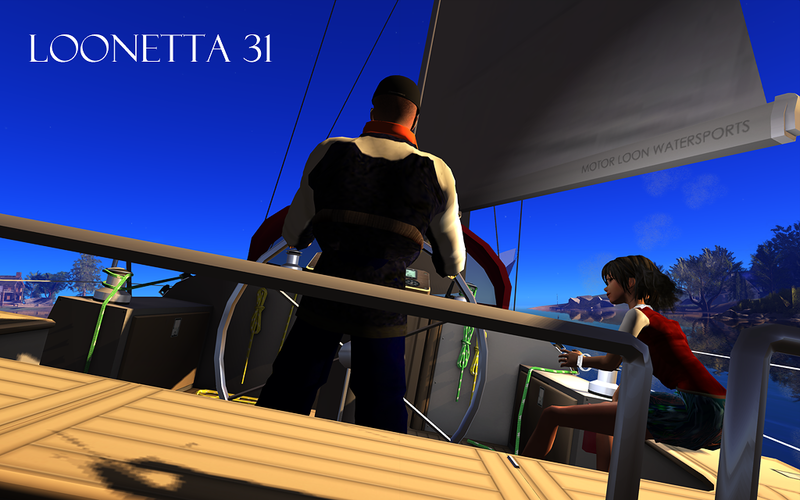 It’s the L00netta 31, and it debuted as a hot Sail4Life auction item during RFL Weekend. 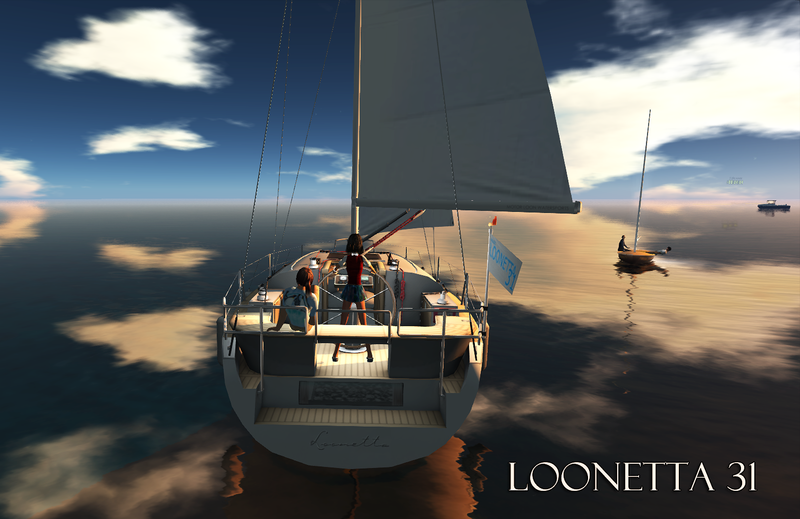 Well, if you were not lucky enough to win a Loonetta at S4L, it’s now available at your local boat dealer. 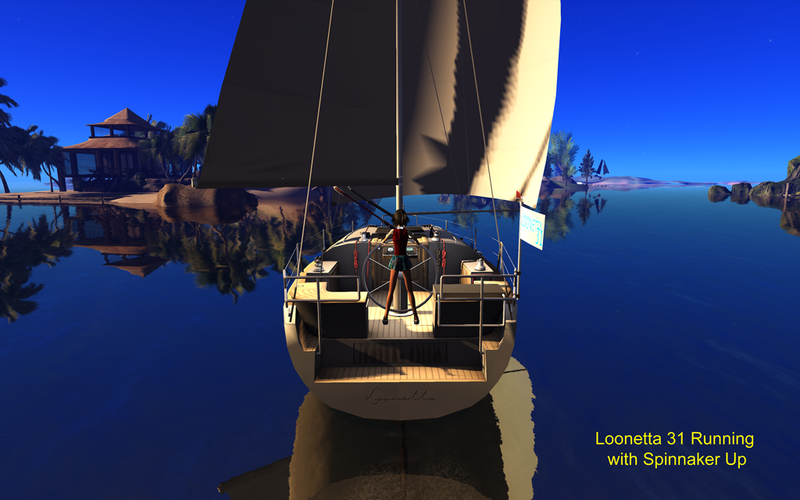 Go take a look and give it a test drive; as a contemporary midsized cruising sloop, I think Loonetta sets a new standard for features and quality of construction. The Loonetta is “100% Mesh.” Mesh construction offers a series of advantages over traditional prim or sculpties. 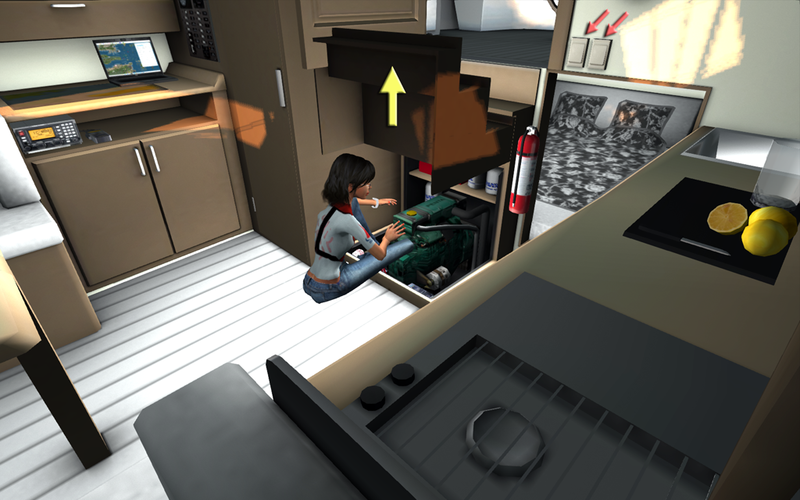 Loonetta shows what this can mean for sailboats; it packs a huge amount of content into the 32 prim limit for SL vehicles. The image below shows what you’ll find in the cockpit. The helm includes a central binnacle with an adjustable wheel for the skipper. A bench extends around the transom, providing lots of space for crew and friends. In fact, the boat has sit positions and appropriate poses for over thirty passengers! There’s a flip-up gate built into the transom that opens a swim platform on the stern, and a two-piece gangway hatch forward that leads into the cabin. The detailing for the winches, blocks, lifelines and railing is all pretty remarkable considering the boat’s 32-prim throw-weight. 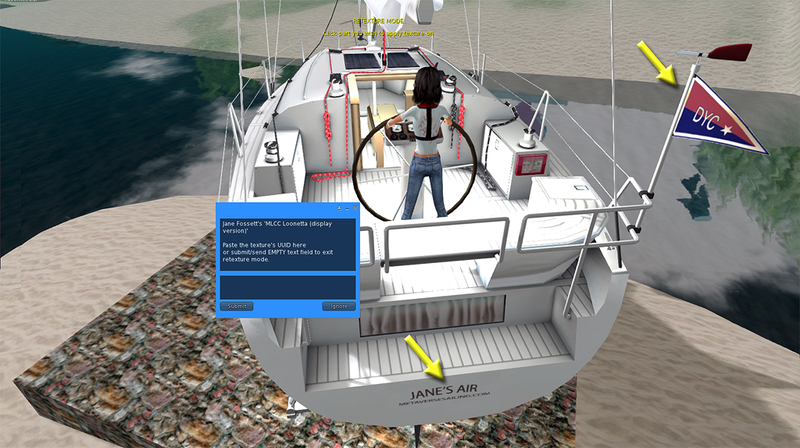 An owner can modify the boat’s colors and textures easily using a pop-up menu, as shown below. It took me less than 5 min. to change the stern flag, the hull hue, and the boat name. On many other boats I usually end up spending that much time just trying to isolate the correct transparency layer to place a new graphic! The hull is solid, and mesh construction means there are none of the typical sculptie-mismatch troubles frequently seen with other boats. A more interesting ‘mismatch’ occurs at the waterline. 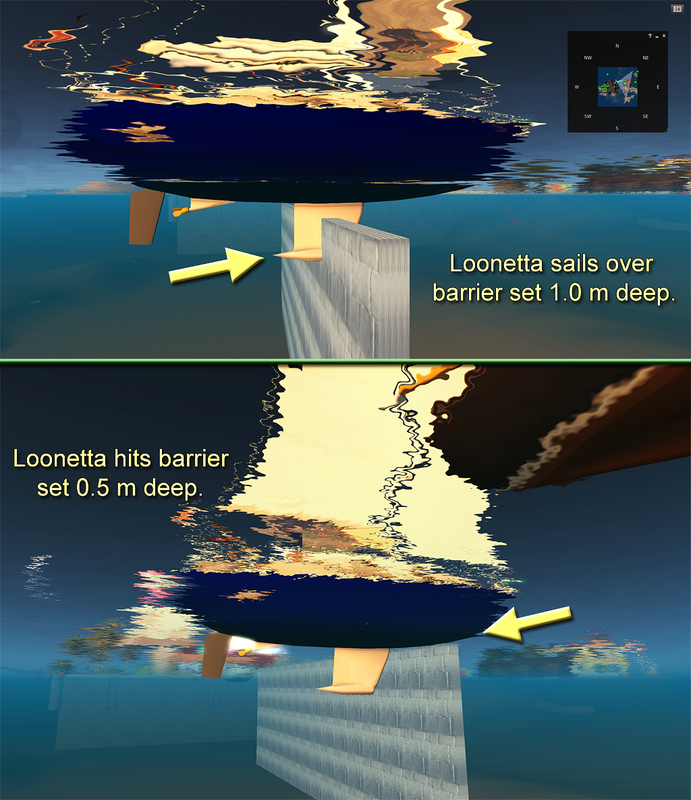 Loonetta’s hull has a graceful convex curve, but the actual ‘collision mesh’ for the hull appears to extend straight down from the deck to the water. 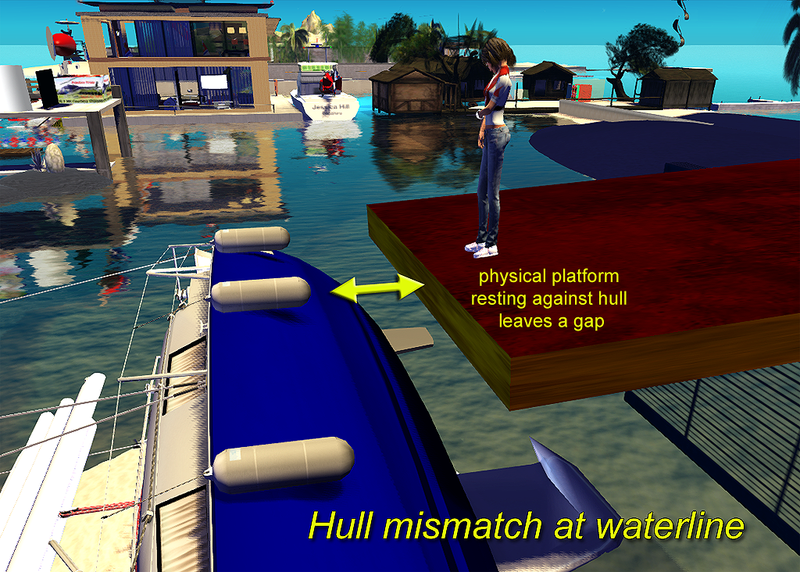 In the image below I’ve turned my boat on it’s side, and I’m standing on a physical platform that’s resting against the hull at waterline level. You can see there’s a significant gap between the visible hull build and it’s effective collision zone. This should only be noticeable when the boats in drydock; I can’t think of any way it might impact sailing. Speaking of drydock, if you rez Loonetta on land it automatically sets up a jack stand cradle, and it shuts off sailing scripts in the boat. 🙂 Be sure to check out the cradle and folding propeller; they are things most sailors never look at, but in this case they are extraordinarily well crafted, and evidence the care Loon put into all the details for this boat. Ok, Loonetta is a cruiser, so let’s look at what the boat offers below deck. As I mentioned earlier, there’s a working, two-piece hatch that opens the gangway from the cockpit to the cabin. Sailors (including the skipper) use an easy pop-up menu to go from topside to a large host of sit-positions and poses down below. 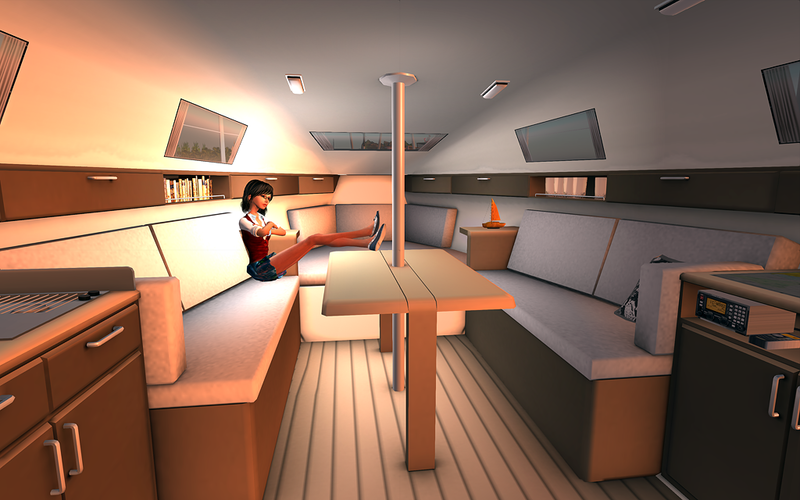 Below deck you’ll find a spacious cabin with a center, folding table surrounding the mast. Speaking of illumination, of course Loonetta comes equipped with the standard set of running lights you’ll need for safe night passages. Loonetta is powered by a main and jib with a modern Bermuda rig; There’s also a self-adjusting optional spinnaker that can provide an extra power boost on downwind points of sail. Underneath it all is a basic, no-frills BWind engine, and the heads-up display shows only essential info about heading, wind speed, and boat speed. The boat is very easy to sail, and there are few details any sailor needs to learn before taking the helm. This simple design seems appropriate, since Motor Loon intended Loonetta for cruising, not racing. The boat doesn’t use a WWC raceline windsetter, and there’s no “Race ID” command. 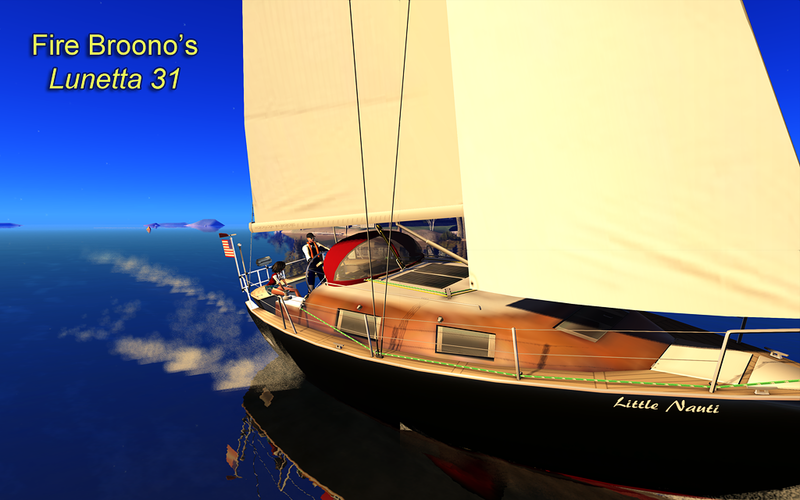 These omissions are intentional, since Loonetta is all about fun within a realistic sailing emulation; this boat accomplishes that goal quite nicely. 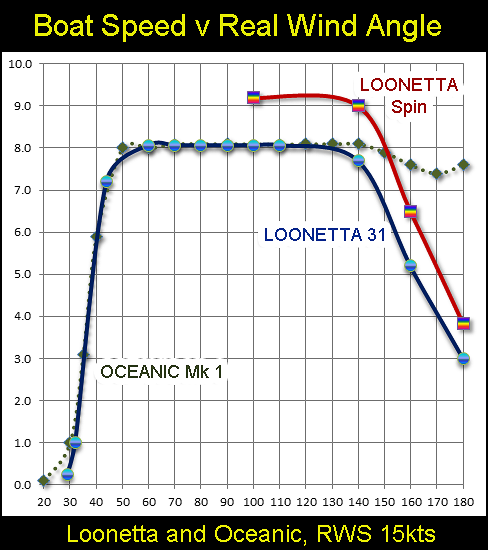 Here’s a chart showing boat speed as a function of real wind angle, with a fixed wind speed of 15kt. The green dotted line is Oceanic, and the solid blue line is Loonetta. As you can see, both boats have nearly identical performance, and a skipper can anticipate a boat speed that’s more than half RWS over a wide range of headings. Adding a spinnaker gives an appropriate downwind boost of about 10%. The Loonetta 31 is Motor Loon’s latest interpretation of a modern, mid-sized cruising sloop. The mesh build is quite remarkable, with content and craftsmanship that set a new standard for contemporary boat design in SL. 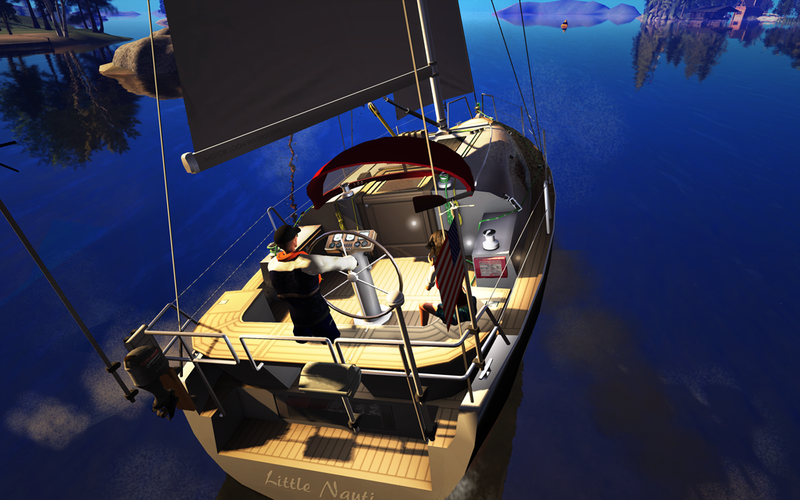 The boat is easy to sail and modify, and it’s loaded with fun features and animations. The sail engine is BWind, and Loon’s intentionally kept the handling simple, with the needs of a casual cruiser in mind; that seems a wise decision. However, let me emphasize there’s nothing ‘casual’ about the care and quality that went into this vessel. Congratulations Loon, and thank you for a remarkable boat! This entry was posted in announcement, Loonetta 31. Bookmark the permalink. So where does one get a demo like you suggest? 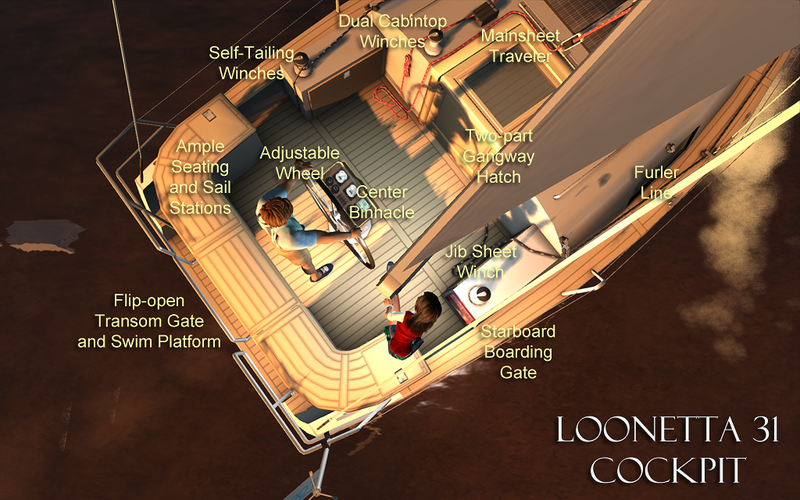 Motor Loon’s boats (and land vehicles) are available on his MLCC sim. He’s presently working to make the boat more available. He had a great deal with Oceanic on the SL Marketplace, offering a free, fully functional beta. I don’t know if he’ll do something similar this time when he posts Loonetta there, but if he does not, that’s understandable an no worries. There are many sailors who already cruise the boat and like it, including myself, Fire Broono, Ronin Zane, Francois Jacques, and Smuth Resident. Ask them or any of the current owners for a ride, and I’m sure they will comply. They’ll also give you their personal impression of the boat and it’s features. Oh, and when you go for that test drive, make sure they give you the helm so you can try Loonetta out yourself. Fix: Optimizing. Boat now uses even less memory and has 1 script less. Script-cycles while moored also lowered alot. Fix: Wave rocking improved, boat don’t “nosedive” into the water now when going fast. Fix: Sail / jib didn’t work correctly with retexturing via menu. Fix: Workaround for the current bug (loosing animation on crossing to/from some RC regions) improved. – Boat will now warn you about nearby regions that could be troublesome to enter because of the meshbug. In the boat’s HUD it will say for example: Danger: (N) where N then mean region to the North shouldn’t be entered..
Boat actually communicates with my webserver for the data, and I might add more features later using this linkup. When this “bug” is no longer a problem on the grid, the warning system will auto-disable. 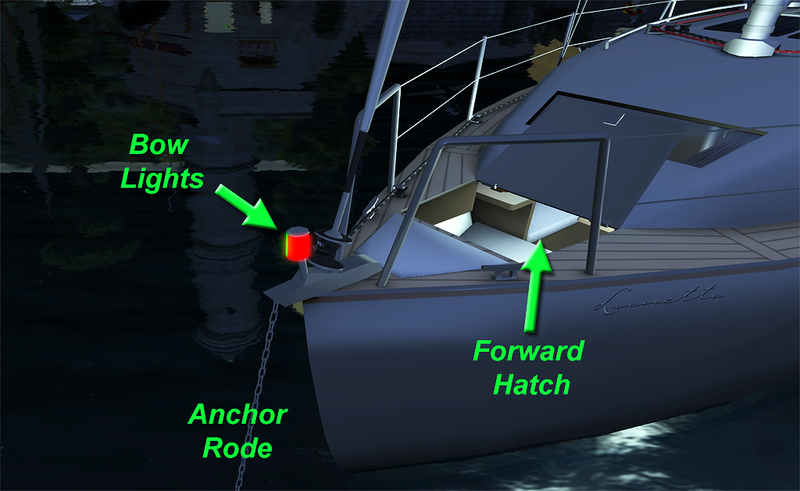 Added: Dash board by helms-wheel now turn fullbright when boat is active and vise versa. Added: Command “hudprim off” will now hide the hovertext totally. 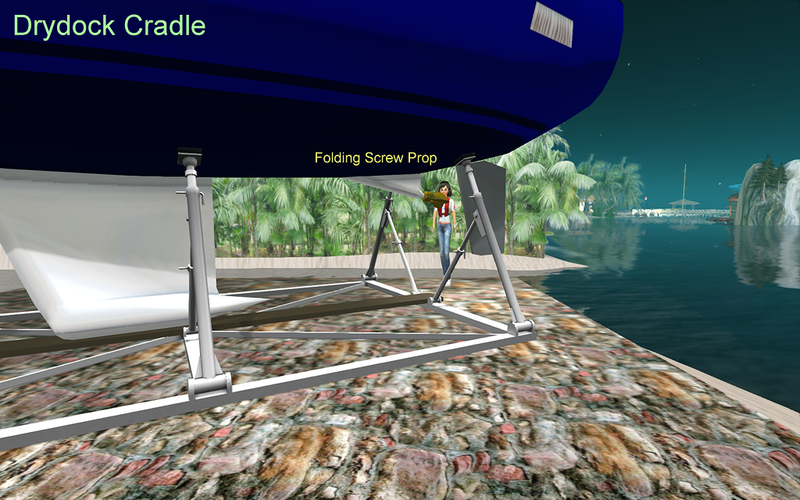 Added: Fixed LOD issue when raising spinnaker, or improved at least. Added: ShowSails feature (in the setup menu) for easier painting of those. 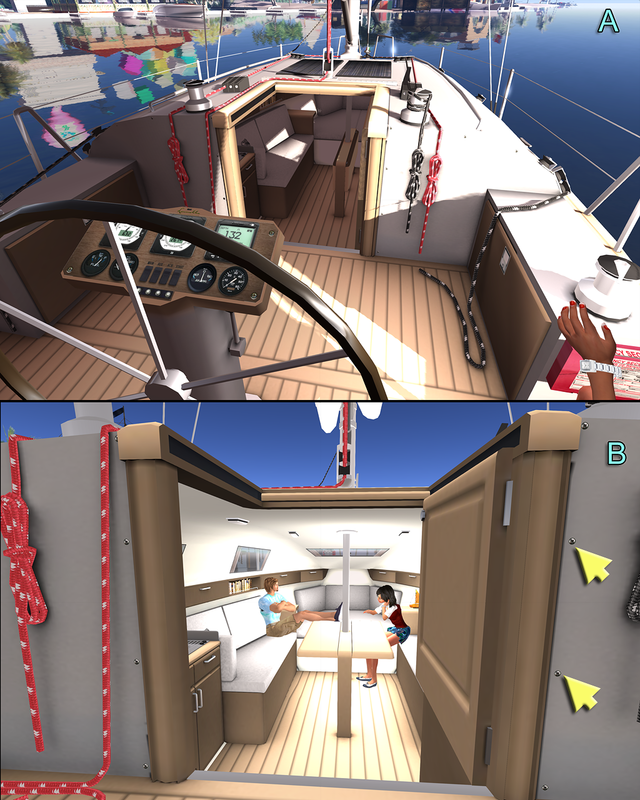 Added: Doors/hatch/stern foldseat now has physics when closed. I then sailed due North, but I crashed trying to enter Muskmelon, the sim directly above Nance on the map. Hopefully this whole mesh-sim issue will get fixed by Lindens soon, and the warning utility will be unnecessary! Am ever so pleased to be able to sail without all those letters and numbers (on some boats dials) cluttering up my screen. Working windvane is all an experienced sailor really needs.Wind coming from there. Set sails to about here, Sheet in till sails stop flapping. As a boatbuilder recently said “Its not rocket science”. And for cruising I would certainly agree, The visual enjoyment of the whole cruising experience is much improved. Combine that with a helm that centers when released and you have an amazingly realistic sailing experience. Is all a personal thing i reckon and for maxing speed to mark data is helpfull. Seen rl boats with more readouts than the spaceshuttle. tide table in a handy spot, but only so usefull cause by about day three out there i forget what day it is anyways. cant rightly remember where the gps thingy is but im sure i put it in a handy spot. And one of these days will fix the depth sounder. Man can sail from sanfran to skagway like that. 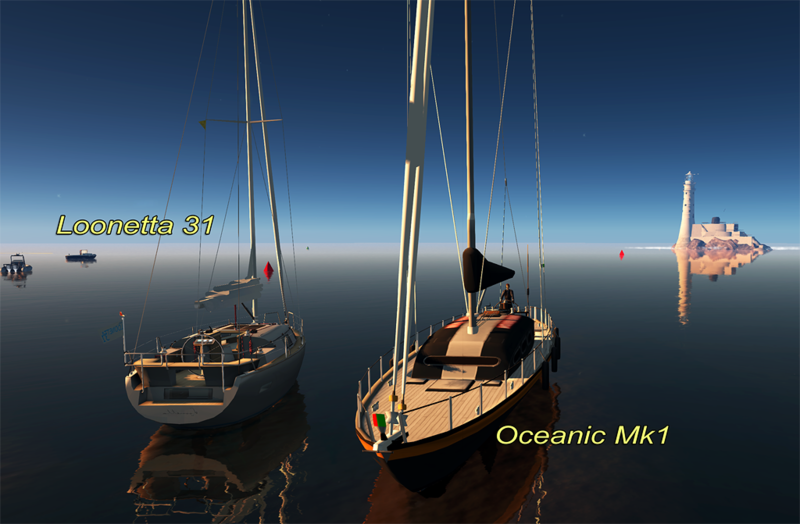 I’m a vehicle fanatic in Second Life and boats are no exception. I have everything from life rafts that just drift along at 2 knots to schooners to galleons to racing sloops (although I don’t really enjoy constant speed or competitive racing – I’m a cruiser and sightseer/photographer). When I first saw a Loonetta on the Blake Sea I was dumbfounded by the detail and had to go to the MLCC region to check them out. A bit of gawking and reading info and I just had to have one. What a joy! Except for my first region years ago I can’t think of any product purchase in SL that has given me more squee. Master Loon is an artist! The only thing missing from the experience is salt spray in my face. The handling, the SOUNDS, the details are really mind-blowing. I’m not only interested in crashing through waves across open sea regions, I also like to travel into every river and interior waterway I can find in the mainland continents, and this boat does it all. In the last three days I’ve probably passed through more than 250 regions by water. One of my favorite pastimes is picking a remote location on a continent then wending my way through all the little LDPW water corridors and traversing inland lakes and seas to some far distant end point (even on another mainland continent, if there is a water bridge). The quick transition from sail to inboard motor and the fine-tuned control of the helm (you can make tiny microadjustments as well as lay heavy on the wheel and turn on a dime) make traversing every waterway an enjoyable challenge. The entire ship is no mod, but the amount of customizing and colorizing to the fine details you can do through the menu system is amazing. Add to all that the fact that Motor Loon gives you all the textures full-perm with the set so you can export them and customize them to your heart’s content — I created a personalized flag and am working on the design for the sails — and I can’t think of a better purchase for the money. I’m often in-world so readers here who want to give the helm a try can IM me and if I have time we can cast off for a test run. I spotted one of these the other day in a waterway south of the Blake Sea and immediately had to go check it out. Amazing boat, and exactly the sort of craft I enjoy. A pretty bulletproof, simple cruiser with a lot of nice detail. It has very quickly become my favorite boat to kick around in.